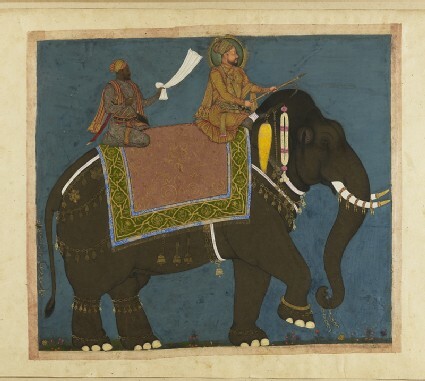 One of the outstanding paintings of Muhammad Adil Shah’s reign, this composition of an elephant with riders derives from contemporary Mughal models but is transformed by its Deccani palette and sensibility. Wearing a gold robe, the Sultan directs the elephant while his African minister Ikhlas Khan rides behind waving a cloth. This painting is as much a portrait of a prized royal elephant as of its distinguished riders.